"The Chesapeake Catboat Association serves to provide a central point of contact for all Catboaters and Catboat enthusiasts on the Bay. We sponsor or attend multiple races and events each year as well as the National Catboat Association's meeting in Groton, CT."
Our Website - www.chesapeakecatboats.org - shows all of our events, newsletters and all sorts of catboat information and lore. 4. Note the address for 2019 Dues Pay Up or Sink! 6. For Articles you want in the CBA Bulletin, Please submit to Steve Flesner, flesner00@comcast.net. 7. NEW: If you need or want to crew, please see the BUTTON on the Events Page. Fill out to short form and submit. And the gray mist on the sea's face and a gray dawn breaking. I must go down to the seas again to the vagrant gypsy life. The Chesapeake Catboat Association (CCBA) was caught on film during their annual Spring Long Cruise by local TV out of Salisbury, MD. 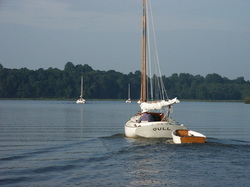 That year’s cruise destination as planned by CCBA Cruise Commodore Marc Cruder and his Wittholz 25 Wanderer was the lower eastern shore of Maryland. CCBA and CBA member Larry Antonik hosted a total of 8 catboats, including his own Marshall 18 Purrrfection and the yawl rigged Marshall 22 Muskrat down in a remote marsh area known as Dames Quarter. This pristine, largely unchanged and natural part of the Chesapeake Bay is seldom visited by sail powered vessels, much less catboats, so it didn’t take much for this group of shallow water gaff sailors to be noticed by the locals. Feature writer and photographer Charles Paparella of WBOC TV 16 met the catboat cruisers along the way at their mid-cruise stop in Vienna, MD on the Nanticoke River and put together this nice piece that aired on Father’s Day 2007, just one day after the completion of the cruise. The four minute clip, with underway video footage from the deck of CCBA member Rich Mclaughlin’s Marshall 22 Tenacity, melds the wayward nature of Chesapeake catboaters and their owners with the priceless rewards of a natural escape just in time for Father’s Day. some aspects of the site may not be viewable.